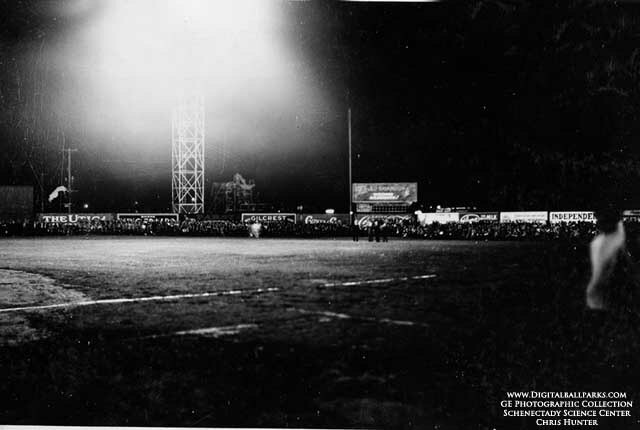 The game was so highly publicized that NBC came in to broadcast the final 5 innings of the game which didn't end til 1am (the game time was pushed back to accommodate NBC). It was a complete success and by the end of the season, 38 other teams had adopted night baseball. Holcomb Park had put itself permanently into baseball history. With all of the excitement, Stan Keyes stepped up to the plate to show off as best he could and posted the best power season of any Des Moines player in history slamming 35 2B, 18 3B and a record breaking 35 HR while batting .340 beating the record of 32 HR set by Ping Bodie and Dutch Wetzel. Al Van Camp returned to hit .343 with 28 2B, 11 3B and 18 HR and Fred Berger hit 29 2B, 17 HR and batted .304 to provide some protection to Stan Keyes. As for the pitching… it was just a bit above average and the Demons finished just a bit above average with a 77-71 record for 4th place. Despite the "average season" the Demons did well at the gate thanks to their introduction of Night Baseball to the world.